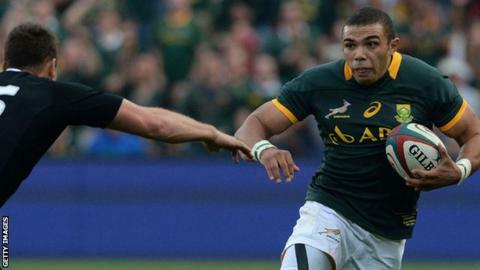 South Africa will have to change their back three for the match against Wales because of players' club commitments. Wing JP Pietersen (White Knights) will return to Japan with Bryan Habana (Toulon) and full-back Johan Goosen (Racing Metro) returning to France. Prop Guthro Steenkamp has also gone back to France while Jannie du Plessis has failed to recover from an injury. Wales will be without some England-based players for the match which falls outside World Rugby's Test window. Springboks assistant coach Johann van Graan says they had planned for the predicted absentees this week. "That's why the coach selected a bigger squad because we knew this week was coming," he said. "Both the wingers available have played in Test matches this year. Cornal [Hendricks] has been one of our stand-out players in 2014 and Lwazi [Mvovo] scored two fantastic tries against Scotland in Port Elizabeth." Gloucester duo James Hook and Richard Hibbard are not available for Wales, along with Bath loose-head prop Paul James and Wasps second row Bradley Davies. However, all Wales' France-based players will be available, along with Northampton Saints wing George North who has negotiated his release for Test matches. Van Graan described Wales' 34-16 defeat by New Zealand as "a real Test match that could have gone either way." "I thought both teams went at each other, with 10 minutes to go there was one point in the game," he added. "You have to credit Wales' defence, New Zealand had to go in behind them with some kicks and only then did they manage to get some momentum."